Cargo volume climbed 5.4 percent in 2015 compared to 2014 at the Port of Long Beach. For 2015, imports through the Port of Long Beach rose 3.1 percent while exports dropped 4.9 percent. The strong U.S. dollar continues to favor imports and discourage exports. Propelled by six consecutive months of rising cargo volumes in the final two quarters of 2015, the Port of Long Beach recovered from systemic congestion and cargo diversion in the first quarter to deliver one of its strongest results on record. For only the third time in its 105-year history, Long Beach topped seven million TEUs during the year. In December, the port achieved 5.1 percent overall growth, compared to December 2014. Imports increased 7 percent to 296,002 TEUs, while exports fell 4.1 percent to 126,118 TEUs. In December, empties rose 9.5 percent to 174,328 TEUs. For 2015, a total of 7,192,066 TEUs moved through the harbor. Imports rose 3.1 percent to 3,625,263 TEUs, while exports dropped 4.9 percent to 1,525,560. Empty containers rose 20.2 percent to 2,041,243 TEUs. 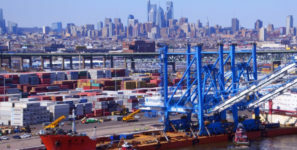 The strong dollar continues to favor imports and discourage exports, resulting in more empties being sent back overseas to be refilled with goods. During July and August, Long Beach achieved record cargo volumes resulting in the Port’s biggest quarter in its history — more than two million TEUs moved through the Port in the third quarter.